Here is multiple-award winning author David Brin's most important, most ambitious, and most universal novel to date—a blockbuster epic that transcends his already distinguished body of work in scope and importance. A microscopic black hole has accidentally fallen into the Earth's core, threatening to destroy the entire planet within two years. Some scientists are frantically searching for ways to prevent the disaster. But others argue that the way to save the Earth is to let its human inhabitants become extinct: to let the evolutionary clock rewind and start over again. Earth is an edge-of-the-seat thriller, a kaleidoscopic novel peopled with extraordinary characters and challenging new visions of an incredibly real future: global computer networks that put limitless information at everyone's fingertips, and environment ravaged by the greenhouse effect, a quiet revolution by the politically powerful elderly. More than a compelling, masterfully told story, Earth is a profound testament about our responsibility to our planet—a message so stirring, it reaches out from the pages to embrace and inspire us all. 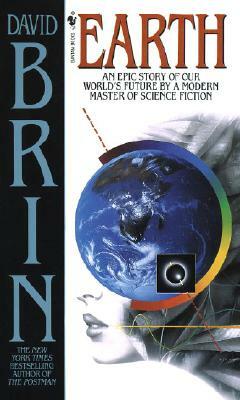 David Brin is a scientist and the bestselling author of Sundiver, The Uplift War, Startide Rising, The Practice Effect, The Postman, Heart of the Comet (with Gregory Benford), Earth, Glory Season, Brightness Reef, and Infinity's Shore, as well as the short-story collections The River of Time and Otherness. He has a doctorate in astrophysics and has been a NASA consultant and a physics professor.